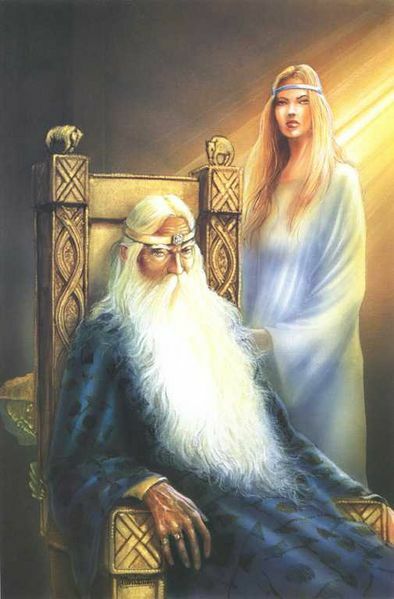 Glorfindel comes to Elrond with Haldir of Lothlorien. Haldir brings news of the breaking of the Fellowship. Saruman sends his army out with the purpose of killing Theoden of Rohan’s son, Theodred. Theodred and his men are attacked. Theodred is slain. 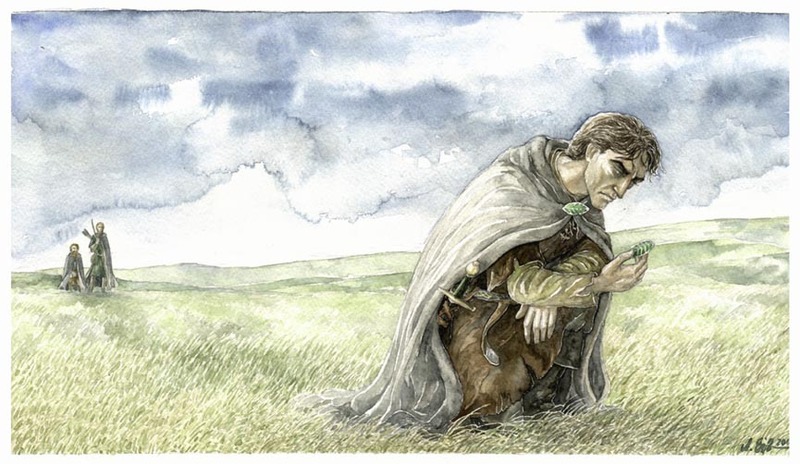 Frodo and Sam wander Emyn Muil, frequently becoming lost. They see the way down at the edge of a cliff, but cannot get down. 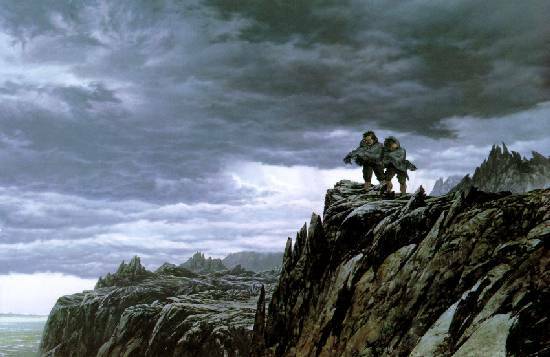 As they try and climb down the cliff, a dark shape flies overhead and Frodo falls to a ledge below. Sam remembers his elven rope and they climb the rest of the way down. Sam pulls on the rope, which surprisingly unfastens and falls down. In the rain that night, Sam sees a creature crawling towards them. They see that it is Gollum, who jumps on Sam. Frodo subdues him with Sting. Gollum tries to escape but they capture him and bind him with the rope. Gollum vows obedience and leads them on towards Mordor. Gollum forces them to travel by night. He chokes on lembas bread and refuses to eat more. Sam waits until Gollum falls asleep before resting himself. When they wake they find Gollum gone. Gollum reappears later, with fish. They walk through the Marshes. Gollum says not to follow the lights. At night, a Ringwraith flies overhead. As they come closer to Mordor, Frodo hears Gollum talking to himself over his desire for the Ring and his vow to serve Frodo. Adapted from chapters ‘The Taming of Smeagol’ and ‘The Passage of the Marshes’ of The Lord of the Rings and ‘The Battles of the Fords of Isen’ from Unfinished Tales. The Witch-King reports back to Sauron about Aragorn, Isildur’s heir. Sauron is noticeably concerned. He commands the Witch-King to find Frodo and prepare the army to attack Gondor, Rohan and the North. Scouts report to Eomer of the orc band coming down from Emyn Muil. Eomer seeks permission to hunt the orcs down. Grima and Theoden forbid it. Eomer talks to Eowyn about Grima’s treachery before heading out to hunt the orcs late at night. Merry and Pippin lie captive. Pippin listens to the orcs, realising there are two groups arguing. The orcs fight, killing several of their own. Pippin cuts his bonds, tying them loosely around his wrists. The hobbits are picked up again and carried on. 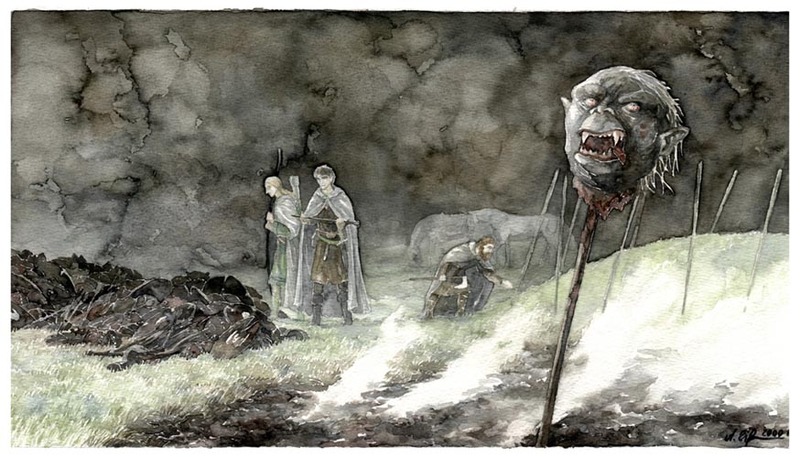 Aragorn, Legolas and Gimli come across the slain orcs. They continue on. Pippin breaks free, but is caught. Before he is caught he places a broach in the road. Aragorn, Legolas and Gimli come across this soon after. 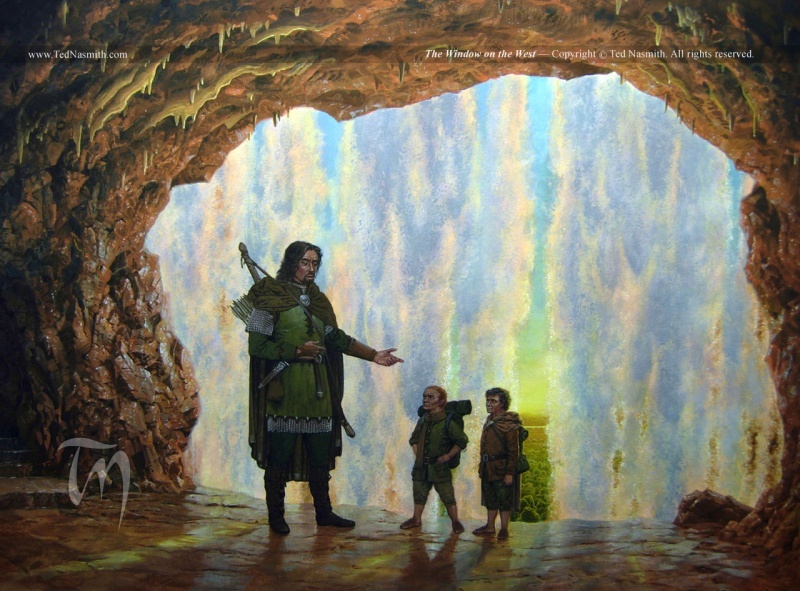 Grishnakh searches the hobbits for the Ring. 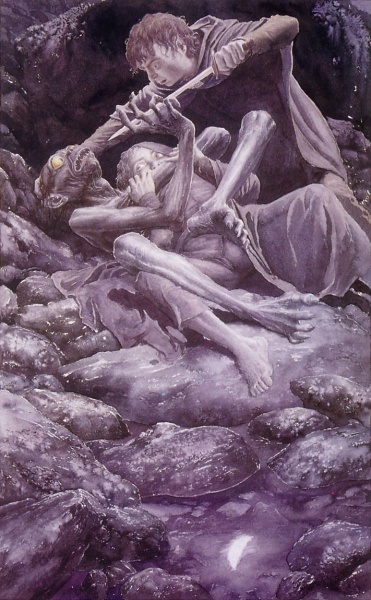 Merry, imitating Gollum, leads Grishnakh to believe they have the Ring. He tries to escape with them. Eomer and his riders come upon the orcs. They kill all of them, including Grishnakh. 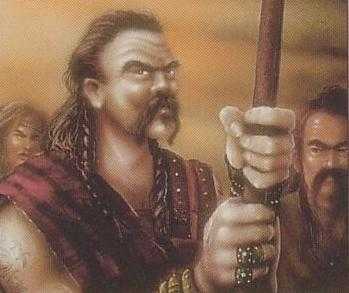 Eomer personally kills Ugluk. 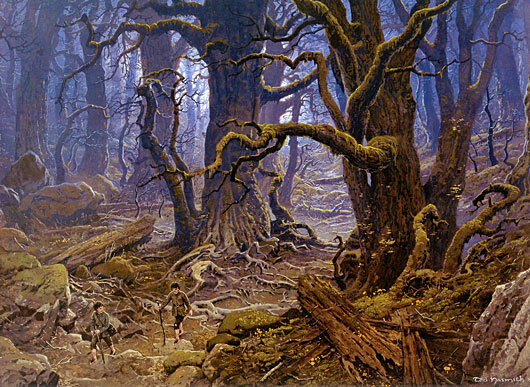 Merry and Pippin run into Fangorn forest. Aragorn comes across Eomer the morning after. Eomer tells of the slaughter of the orcs, having seen no hobbits. They lend Aragorn two horses. 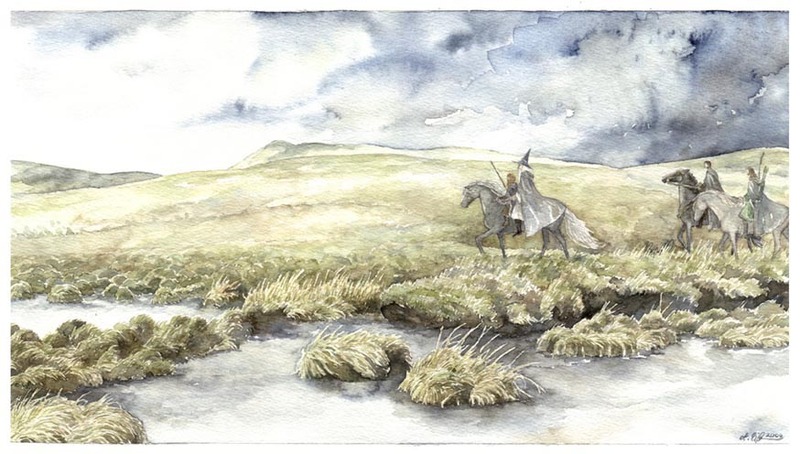 Aragorn finds the slaughtered orcs and the graves of 12 Rohirrim soldiers, but no sign of Merry and Pippin. 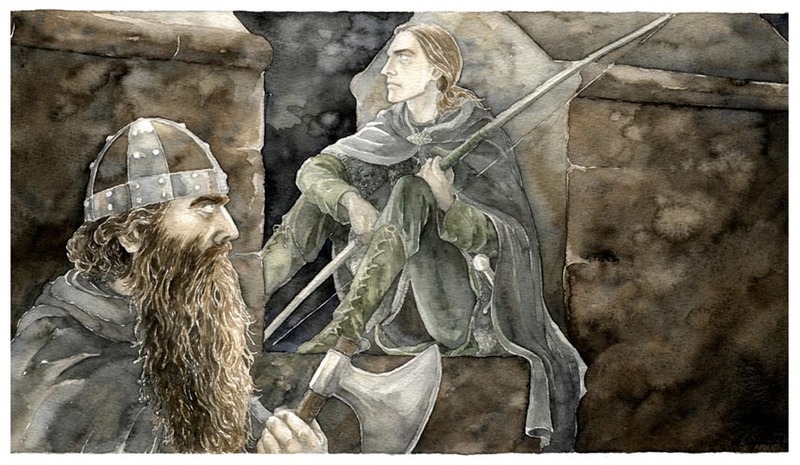 Gimli sees an old man in the forest, who vanishes along with their horses. Aragorn finds cut rope, a Lorien leaf and hobbit prints. They follow the prints deeper into the forest. 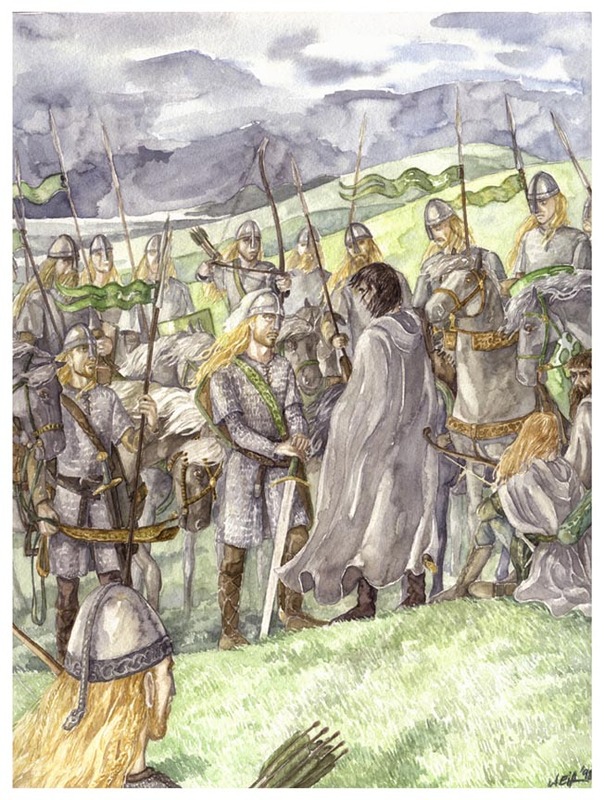 Grimbold and Elfhelm come to Edoras with Theodred’s body. Saruman contacts Sauron through the Palantir. Sauron commands Saruman to destroy Rohan and Isildur’s heir. 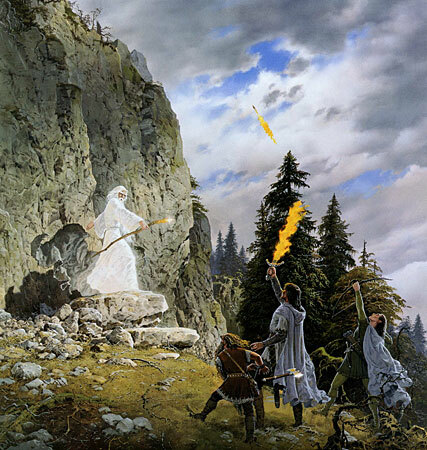 The men of Dunland swear to Saruman’s cause. He sends them to pillage Rohan. Merry and Pippin stop for a drink of water. 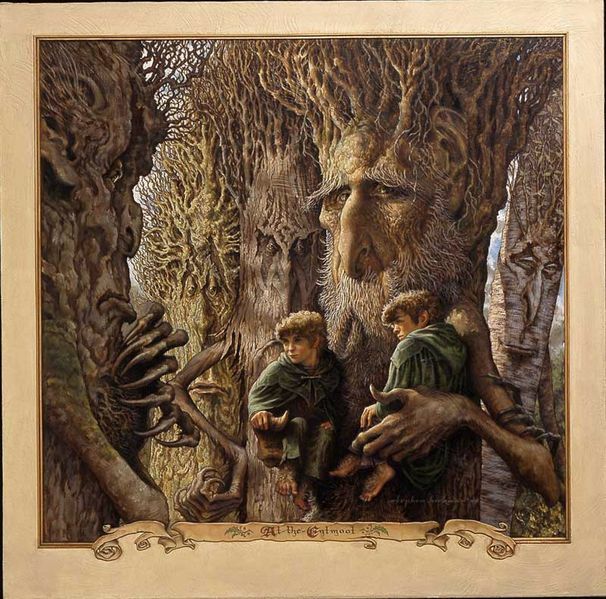 A tree behind them speaks, revealing himself to be an Ent – Treebeard. Treebeard explains the Ent’s history to the hobbits, before taking them back to his home. Aragorn, Legolas and Gimli follow the prints to a rock wall, in freezing weather. Climbing to the top, where they see the old man again. Fearing Saruman, Gimli tells Legolas to shoot the old man. Aragorn orders the man to identify himself. The man throws off his grey cloak, revealing white clothes. It is Gandalf. Gandalf explains his battle with the balrog, his rebirth and his time in Lothlorien. He brings messages from Galadriel (flashback). Gandalf knows that Treebeard has the hobbits. He leads the others out of the forest. On the way he tells of both Saruman and Sauron’s mistakes and how to use them to their advantage. 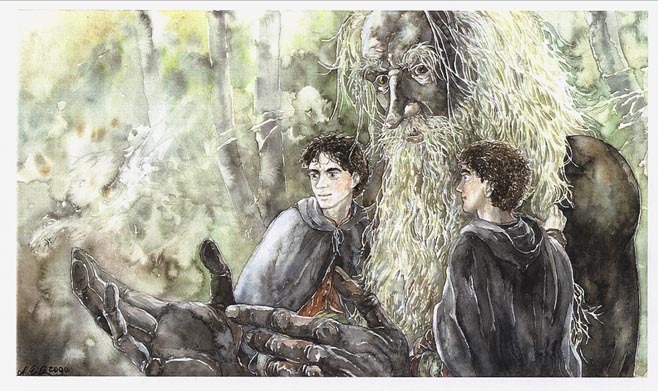 Treebeard tells Merry and Pippin of the return of Gandalf. He sets them to sleep in his home. The next day, Merry informs Treebeard of Saruman and the orcs’ destruction of Fangorn. Treebeard gives them food and water. He plans to stop Saruman. More ents come to the clearing to meet with Treebeard. 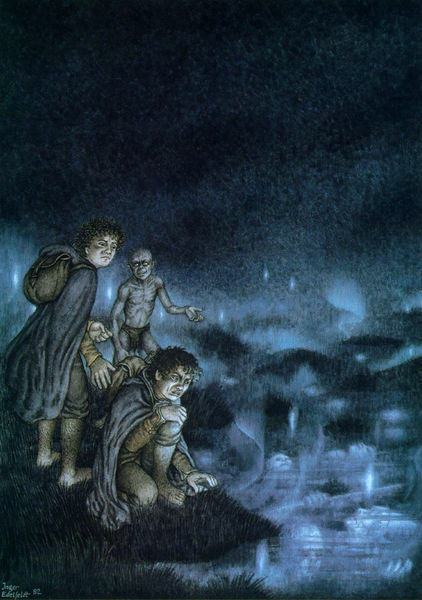 Merry and Pippin are left in the care of Bregalad. 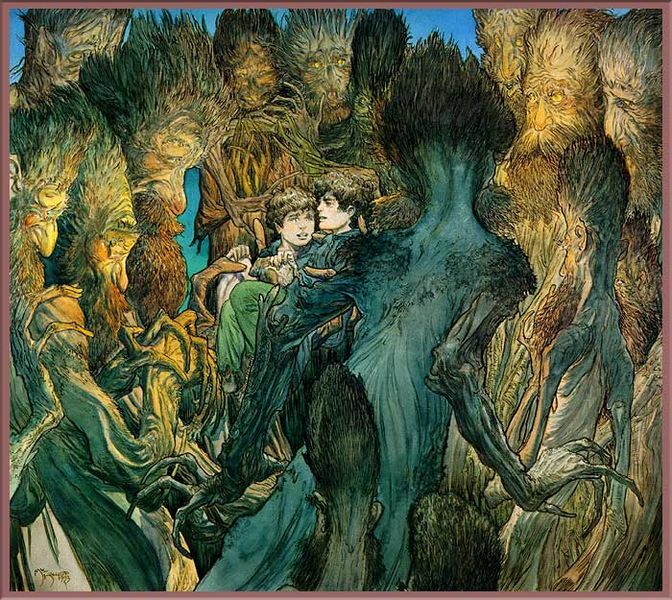 Treebeard begins talking to the other ents about an alliance with Rohan and war with Saruman. Gandalf summons Shadowfax, who brings the other horses with him. They begin the ride to Edoras. Adapted from chapters ‘Treebeard’, ‘The White Rider’ and ‘The King of the Golden Hall’ and Appendix B of ‘The Lord of the Rings’. 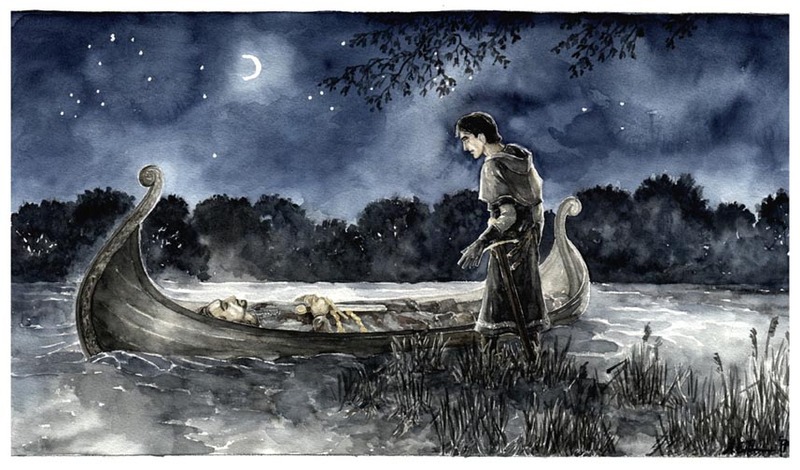 Faramir sees the funeral boat of Boromir. A nazgul flies over Frodo, Sam and Gollum. Frodo thanks Gollum, but Gollum refuses to go further. Frodo must threaten him with Sting to make him move. Above the slag hills, they finally see the Black Gate. The Gate is closely guarded. 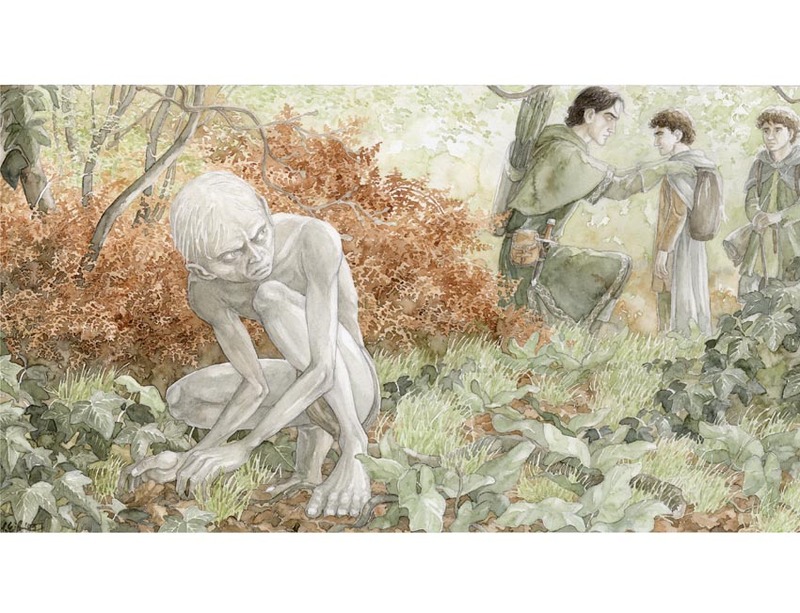 Gollum says they must not go inside, but Sam and Frodo reply that they must. Before Frodo attempts to enter the Gate, Gollum tells them of other ways into Mordor. Gollum tells of the passage above Minas Morgul. He pleads with the hobbits to take that path instead. Four Nazgul fly out above the Gate. Easterlings arrive as well. Gollum leads Frodo and Sam away from the Black Gate. Faramir brings the cloven horn of Boromir to his father. 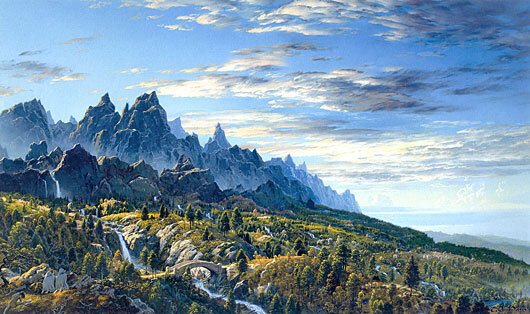 Denethor angrily orders him to Ithilien. 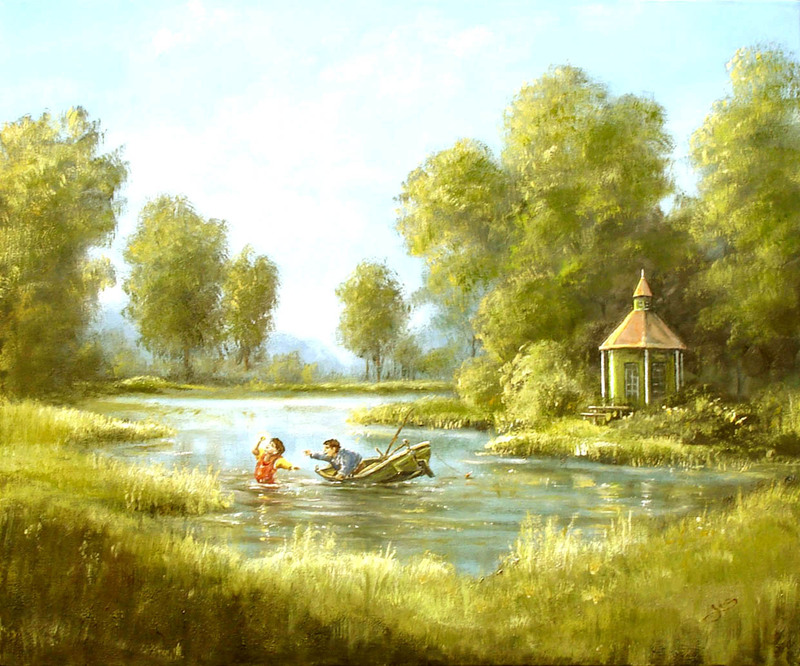 Frodo and Sam reach green land again, where they bathe in the water. Gollum hunts for food, bringing back rabbits. Sam notices graven lines on Frodo’s face and neck. Sam cooks the rabbits in a stew. 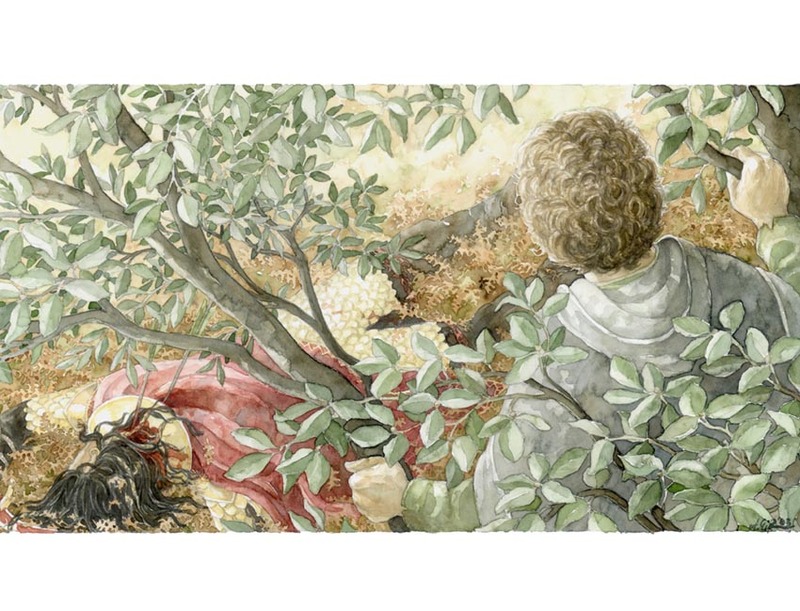 Frodo awakes and warns Sam of the fire. 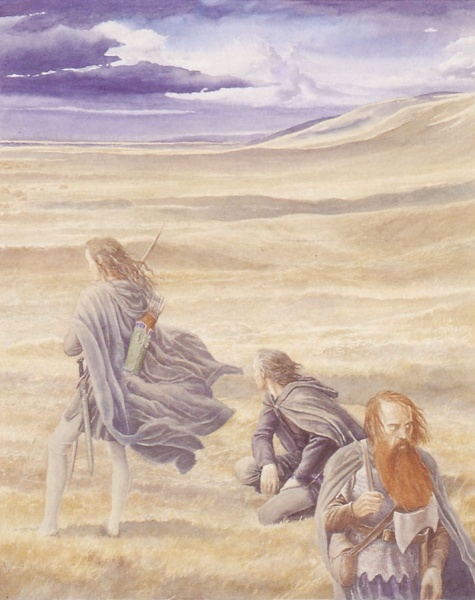 The hobbits are found by four men. One of them is Faramir. Faramir does not believe the hobbits are travellers. Frodo explains their separation from Aragorn and Boromir. Faramir sets a guard on the hobbits and disappears into the forest. From afar, Frodo and Sam witness Faramir’s men attacking a company of Haradrim. 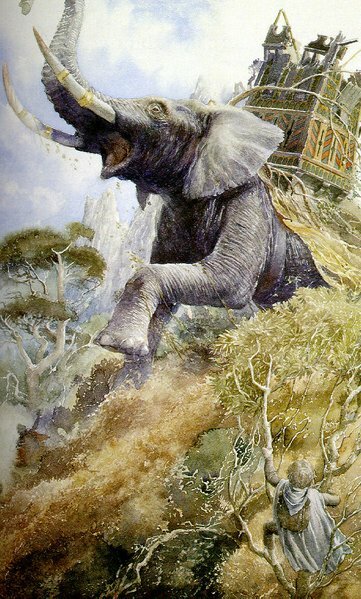 A mumak comes out of the forest and crushes the remainder of the Haradrim. Faramir returns and orders Frodo and Sam to be taken with them. 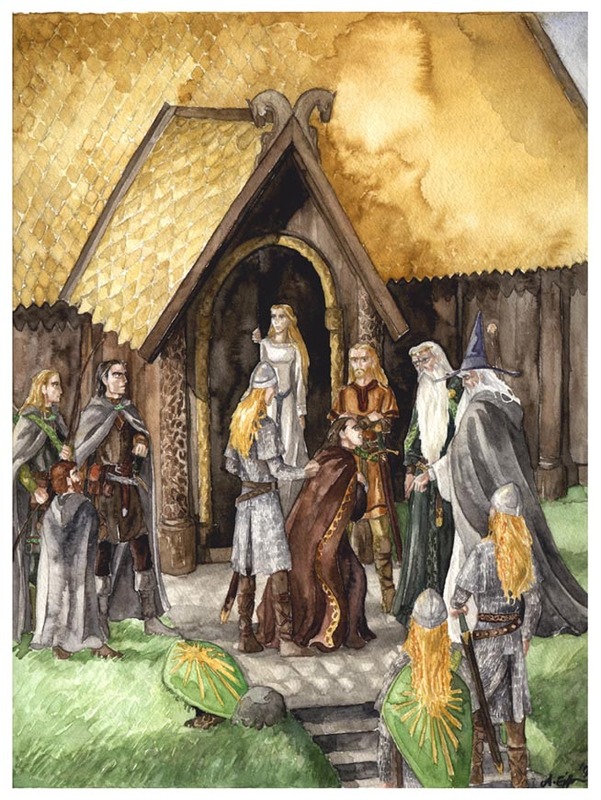 Adapted from chapters ‘The Shadow of the Past’, ‘The Black Gate is Closed’, ‘Of Herbs and Stewed Rabbit’ and ‘The Window on the West’ and Appendix A of The Lord of the Rings. 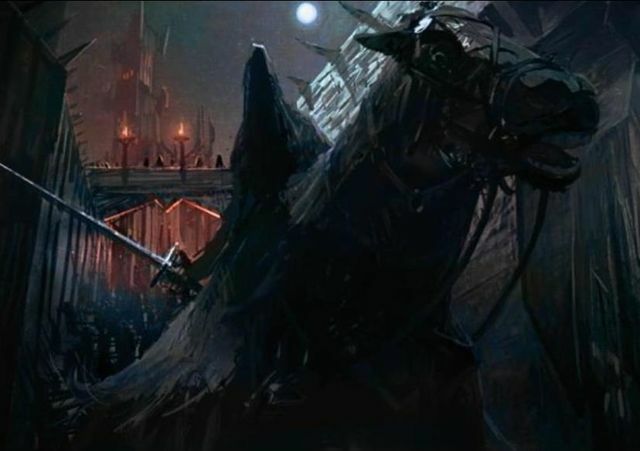 Khamul the Ringwraith sends out armies to attack Lothlorien and the Woodland Realm. 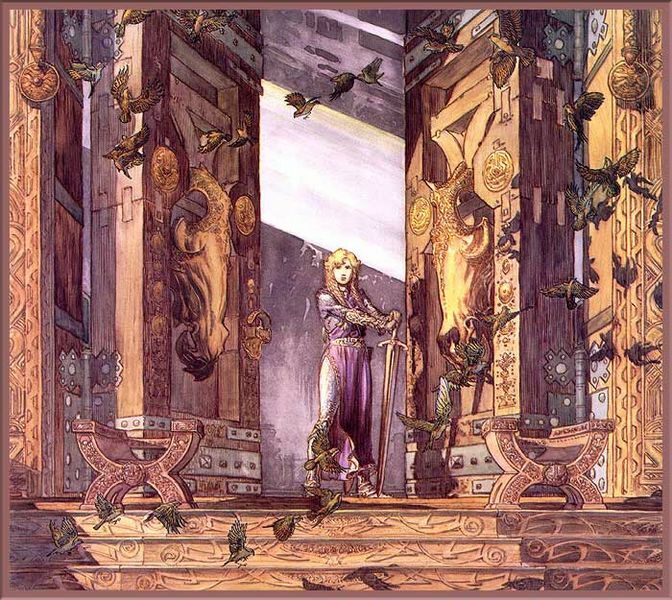 The army of Dol Guldor attacks Lothlorien. 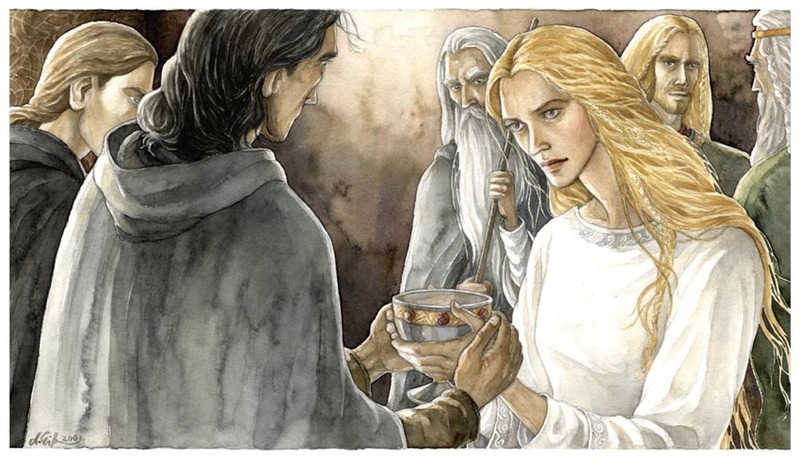 The army is repelled by Celeborn and the power of Galadriel’s ring. Sam awakes to find Faramir interrogating Frodo. Faramir alludes to the dream Boromir told of at Rivendell. Faramir suspects Frodo of betraying Boromir. Faramir confronts Frodo over Boromir’s death, revealing he has seen the funeral boat. 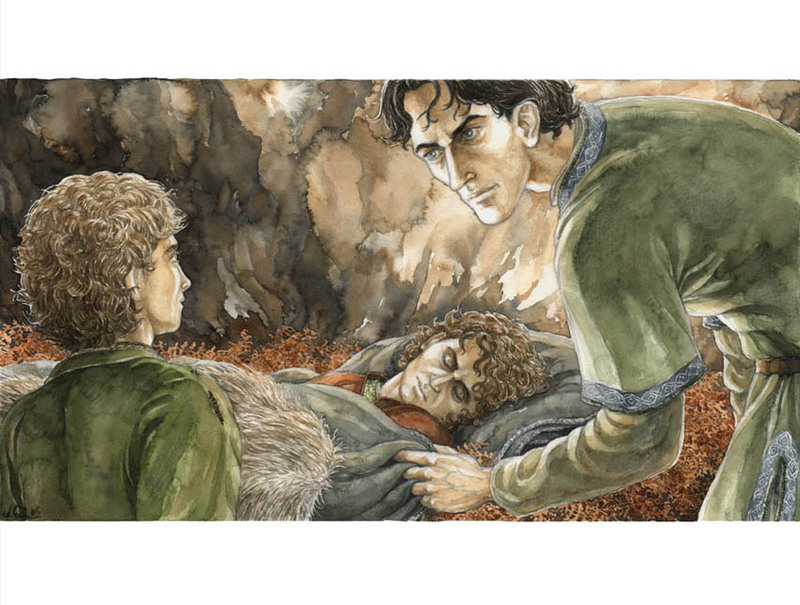 Frodo does not believe Boromir is dead. Faramir cannot hold back his grief, asking for answers about Boromir’s death. Faramir decides to take them back to Minas Tirith. Frodo and Sam are blindfolded and taken west. Faramir asks questions about Isildur’s Bane, suspecting that Frodo carries it. Faramir removes their blindfolds and shows them the Window on the West. Sam accidentally reveals Boromir tried to take the Ring. Frodo shows Faramir the Ring, but he has no interest in it. Frodo tells him of the quest to destroy it. Frodo and Sam go to sleep. 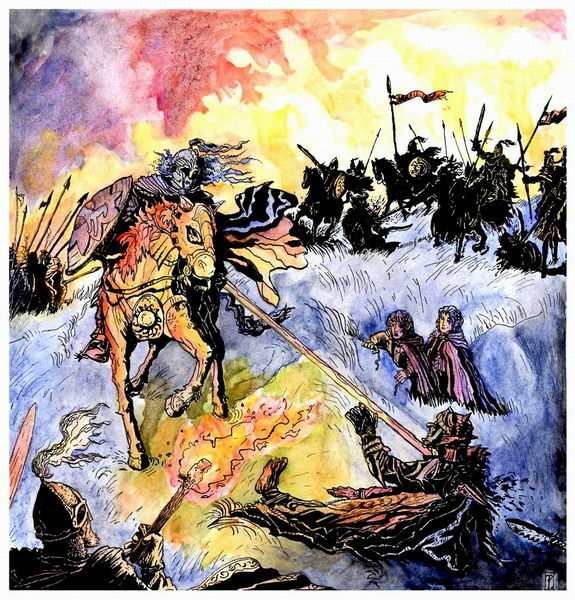 Faramir recounts the battle of Osgiliath, where Boromir, Faramir and a company held the bridge against the Witch-King. The bridge was eventually destroyed. Only four survived. 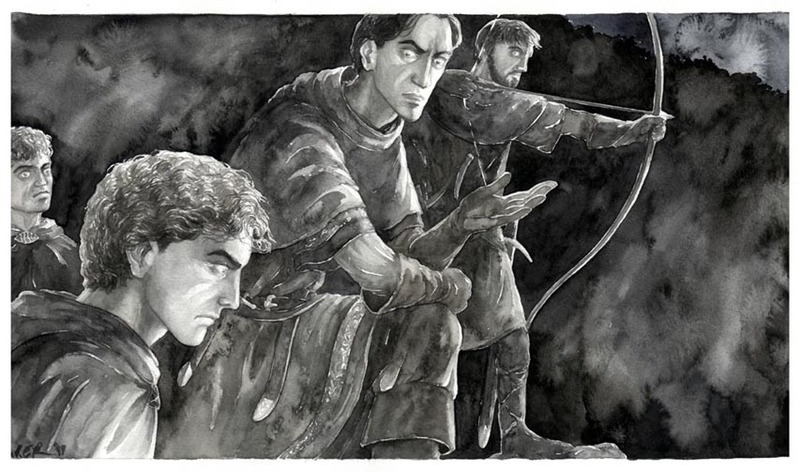 Faramir hears of Gollum in the river, waking Frodo and Sam. Faramir shows them Gollum. 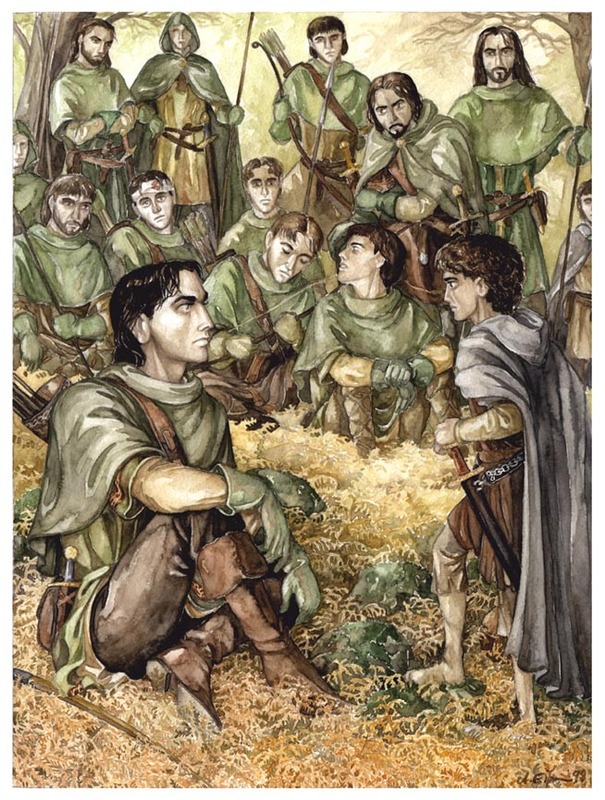 Frodo pleads for them not to kill him. Frodo persuades Gollum to come with him, but Faramir’s men capture him. Faramir interrogates Gollum, who does not co-operate. Frodo intervenes and Faramir trusts his judgment. Faramir takes them back to the road. He warns Frodo about Gollum and Minas Morgul, but Frodo says he must continue. Faramir leads his men back to Osgiliath. Gollum leads them on. From afar, they see the shape of the Morgul Valley and Minas Morgul. 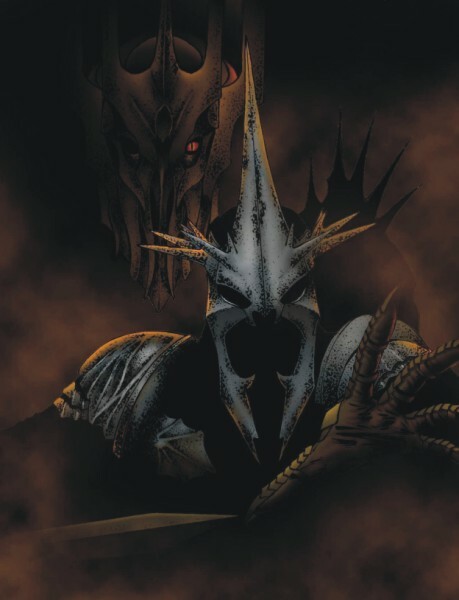 Sauron commands the Witch-King to lead the army to Minas Morgul and then to Gondor. Adapted from chapters ‘The Window on the West’, ‘The Forbidden Pool’ and ‘Journey to the Cross-Roads’ and Appendix B of The Lord of the Rings. Aragorn’s goodbye with Eowyn leads him to remember Arwen. Arwen speaks with Elrond about aiding Aragorn. Elrond replies there is nothing they can do. 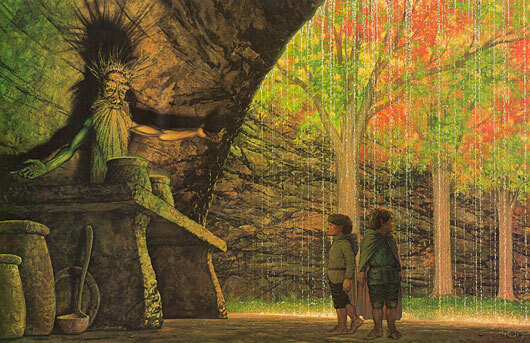 Halbarad and the Dunedain rangers come to Rivendell. Arwen asks them to give Aragorn her standard. 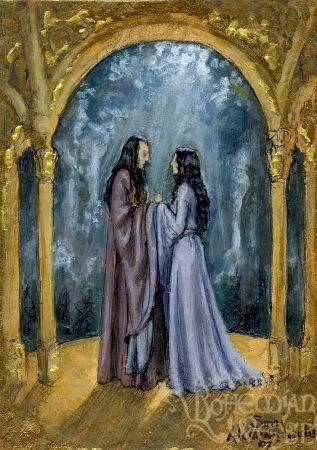 Elrond requests they find and aid Aragorn. He sends Elladan and Elrohir with them, with a message to take the Paths of the Dead. Theoden rides south of Isen. They find many slain. Gandalf sees the uruk army from afar. He returns to talk with Theoden. 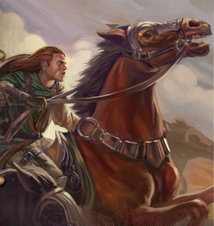 He convinces Theoden to ride to Helm’s Deep and await him there. Aragorn finds little provisions at Helm’s Deep. He prepares the men for battle quickly. Scouts report that the uruk army is heading towards the Hornburg. Aragorn, Eomer and Theoden discuss battle plans. As night falls, the army is seen on the horizon. Theoden commands Gamling to defend Helm’s Dike. 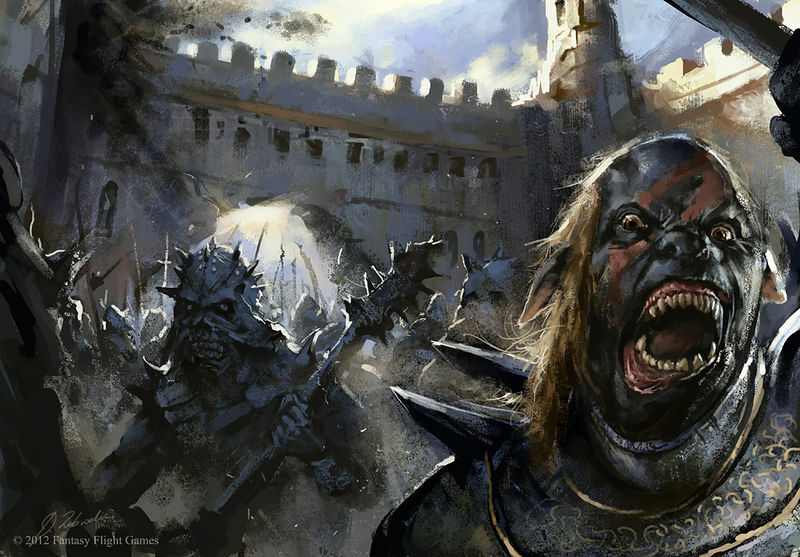 They kill many orcs, but they are forced to retreat. Eomer arrays the men on the tower and deeping wall. The uruk-hai surge towards the wall. They fire arrows, but get no response until they are very close. The first volley of arrows and rocks from the men force the orcs to break rank. The biggest orcs form to try and break the gate. They are scattered by a sortie led by Aragorn, Eomer and Gimli. 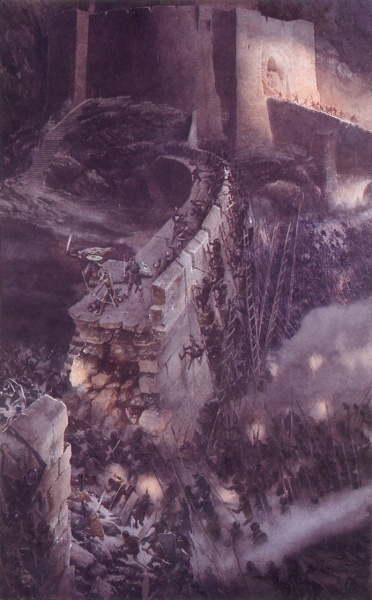 The men barricade the gate as the orcs raise ladders to climb the wall. Aragorn and Eomer push the weary men to keep fighting. A small party of orcs creep through the culvert and attack the men from behind. Gimli and the men push them back, barricading the culvert. The wall is breached by blasting fire and many orcs pour in to the deep. Eomer and Gimli lead men to combat the orcs, but they are overrun and retreat into the Glittering Caves. Theoden orders the men off the wall. 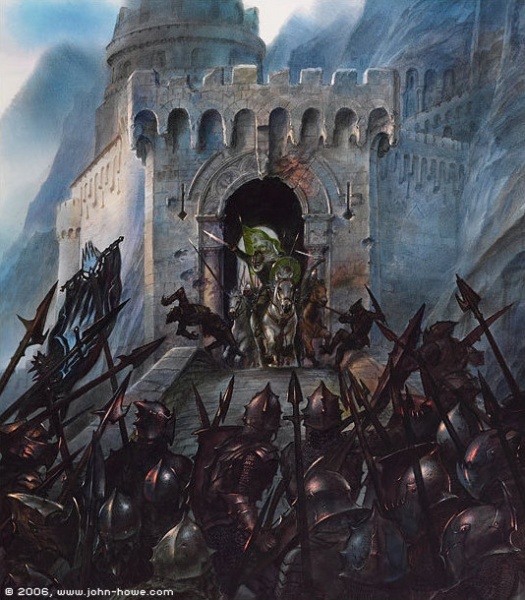 Aragorn and Legolas lead them up the stair to the keep, Aragorn being nearly overcome by orcs. Hama is killed before the gate and his body hacked to pieces. Aragorn and Theoden debate their next move. Aragorn attempts a parley but is shot at. The uruks use blasting fire to damage the gate, eventually destroying it. 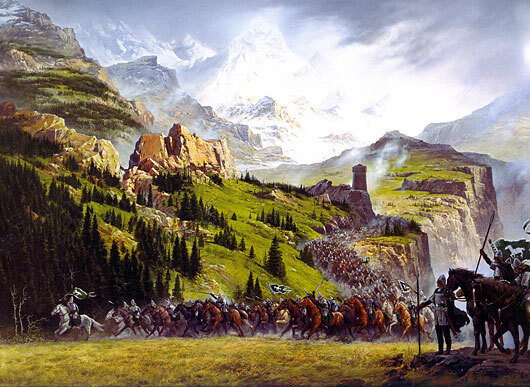 Theoden leads the remaining riders out of the gate into the invading uruks. They push the orcs out of the keep. As the orcs are distracted, Eomer and Gimli lead the men out of the Glittering Caves, forcing the orcs from the deep. As the orcs retreat past Helm’s Dike, Gandalf appears leading a thousand of Erkenbrand’s men. The orcs are gripped with fear and flee into a waiting forest of Huorns. 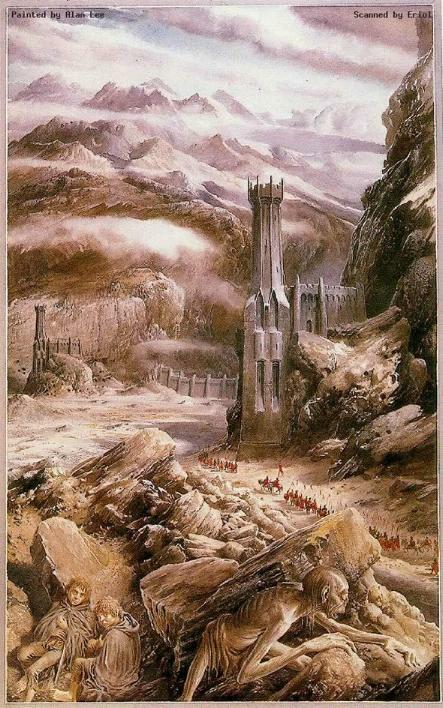 Adapted from chapters ‘The King of the Golden Hall’, ‘Helm’s Deep’ and ‘The Passing of the Grey Company’ of The Lord of the Rings.